Do You Need Nutritional Yeast? I have long been confused by nutritional yeast. And just so you know, I still am a bit. 😉 I am hoping that between all of us, we may sort it out. Nutritional yeast is a dried single-celled fungi. According to Sundance Natural Foods (Eugene, OR) it is present in the air around us and on fruits and grains. This strain of yeast multiplies as it feeds on various types of sugar, converting the sugars into alcohol. Next, the producers pasteurize the yeast to kill it. And that is good, otherwise it would continue to grow in your intestines and absorb the B vitamins that your body needs. 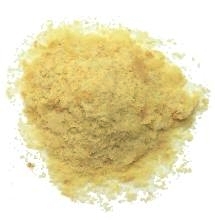 Nutritional yeast is an excellent source of B-complex vitamins, 18 amino acids and 15 minerals, particularly chromium. Chromium is very important in the regulation of blood sugar — certainly beneficial for diabetics and people who struggle with low blood sugar. Depending on whose writings you read, nutritional yeast may or may not be a good source of Vitamin B-12, typically only found in animal foods. Some nutritional yeasts are fortified with Vitamin B-12. The best kind of nutritional yeast starts with a non-GMO strain, which is fed on mineral-enriched molasses. The pasteurization takes place at low temperatures without chemical processing. Unfortunately, according to Sally Fallon Morell in Nourishing Traditions, most commercial brands of nutritional yeast “contain high levels of MSG — formed during high-temperature and chemical processing from the glutamic acid naturally present in the yeast.” She points out that light-yellow colored yeast that dissolves easily is most likely processed at low temperatures. Nutritional yeast is not the same as Brewer's Yeast, which is a by-product of beer-making. Nutritionally, they are similar. However, brewer's yeast has a bitter kind of taste, while nutritional yeast tastes cheeses. Since it is not alive, nor does it feed on refined carbohydrates (as does candida), nutritional yeast will not contribute to a candida yeast overgrowth. Here's where I am not completely settled. The “mineral-enriched” molasses. How natural can this be? Whether or not nutritional yeast is a source of Vitamin B-12. Since the answer is not clear, this gives me and my family another reason to keep eating meat. What do you think? Do you eat nutritional yeast? Will you continue or possibly stop now? What confuses you? References: Sundance Natural Foods (Eugene, OR), Nourishing Traditions, and the Story of Yeast diagram. I have a friend who puts yeast flakes on almost anything. Popcorn, salad, pasta. She’s a macrobiotics-oriented person who’s has gastrointestinal problems for years. I’ve always been a little weary of yeast in general. I don’t buy any of the yeasts. I know nothing about them. I didn’t know that Brewer’s Yeast is made from beer. Interesting. My chiropractor actually recommended I eat nutritional yeast for the vitamins and protein. I really like it on my popcorn or in marinades I make for baked tofu. It can be really delicious and a nice treat, but like everything, moderation is key. It has about 8g protein per 2T – or at least the kind I get. What a great write up on nutritional yeast, thank you for putting it together. I take brewer’s yeast as part of my pre-conception diet. I use Lewis Labs who has an organic, no additive, no by-product yeast with nothing added. It’s a great source of B vitamins and many others as well as minerals. I don’t care for the taste, so I hide it in my morning green smoothie. I don’t know much about nutr. yeast – I’ll have to look up in Nourishing Traditions and see if there is any info there…. Magda, I ran across mention of Lewis Labs yeast in my research, so I appreciate hearing your good report also. What I read suggested that nutritionally, brewer’s yeast and nutritional yeast offer the same benefits, yet brewer’s yeast has the bitter taste. I don’t know if I believe as they are produced by different means. Surely, there must be some difference. Well, anyway, thoughts to ponder. Best wishes for a successful conception! I’ve always heard that brewer’s yeast doesn’t have the same health benefits but I’m still puzzled by nutritional yeast. I just got some awhile back to use in our Caesar dressing. That combined with almond meal gives it the thickness of mayonnaise and the texture of parmeson with a great flavor. I bet it would be great on popcorn – it’s yummy I think! Sustainable Eats – Have you shared that recipe for Caesar dressing on your blog? It sounds delicious! Could you link to it, if so? I am looking for new salad dressings to try. It’s: http://www.pccnaturalmarkets.com/cgi/recipeget.cgi?id=376. This is my local healthy grocery store but they have a great recipe database & their newsletter is fabulously well researched and balanced points of view. Thank you! I will go check out the recipe and also subscribe to the newsletter. We have PC Market down here in Oregon, too. I go there every now and then when I am in Eugene. There used to be one closer to me, in Cottage Grove, but it turned into an all-conventional grocery. You know what, that is not the same grocery we have in Oregon! 😉 Similar name, but different market. Anyway, I will still subscribe! “Dried nutritional yeast is an excellent natural source of B complex vitamins (except for B12) plus a variety of minerals, particularly chromium, so important for the diabetic. Nutritional yeast does not contribute to candida, as has been claimed. Candida feeds on refined carbohydrates, not yeast. In the resources section, they recommend Frontier brand. I am nervous about buying this now, unless I can find Frontier brand. You know, I ordered brewer’s yeast from Azure, and the bag they sent me said nutritional yeast. The kind of nutritional yeast I buy is light yellow and dissolves easily, so I wonder if it is alright? I can’t imaging a salad without it now! First, this is what I take from that quote: 1) Natural glutamic acid is naturally present in nutritional yeast and is beneficial for alcoholism, sugar cravings, and treatment of chronic fatigue. 2) Processing at high temperatures and with chemicals will form MSG from the glutamic acid, and therefore, this type of yeast should be avoided. Second, I would not be worried about the nutritional yeast you purchase from Hummingbird Wholesale (I do not know about Azure), because HW sources nutritional yeast which processed at low temps and fed on molasses. Why don’t you call Azure and ask them what brand and process is behind the nutritional yeast they sell? I *think* theirs might be Frontier, because they carry so many other Frontier products. Thanks so much for this blog post. Someone asked me today what nutritional yeast is. Although I have long used it in making dairy-free cheese sauces and I knew it was high in B vitamins and that it isn’t active like bakers yeast, I still didn’t know how to answer the question, what is it? So I finally know that it is derived some the same kind of bakers yeast but that it is deactivated. I also forgot that some brands can contain msg. This is so important for people to know! .-= Sarah Schatz – menu planner for people with allergies´s last blog post… Why gluten-free breading is as easy as peas =-. I love this stuff and am glad I was told about it. I have slowly started to incoroporate it into my diet, sure makes one awesome cheesy sauce! I had no idea about the MSG, will be looking into this one more. But it is definitely high on the B vitamins, especially riboflavin, as it will turn urine bright yellow, the same as when people take B vitamins. I have a 2 year old that has 9 food allergies. One of them being cane sugar. I was wondering if anyone knows if Nutritional Yeast has any form of sugar in it since the one I have is grown on molasses. Any help would be hugely appreciated! Shawna – That’s a good question, and I don’t know for sure. I would suspect that the sugar gets all used up by the yeast, as it feeds on the sugar to multiply. But you might want to contact the company who makes it to find out for sure. It is also possible there could be a molasses residue. I’m sorry I don’t know the answer. I would still avoid it, or at least test it, depending on your son’s level of sensitivity. I was very sensitive to corn and all byproducts for some time (before eliminating them completely for years until my gut healed). At one point, I thought I had eliminated all corn products, only to discover I was still reacting to the dextrose in iodized salt! That’s a tiny amount. More pertinent to your question, I also reacted to xanthan gum, like in dressings. Xanthan gum is made from bacteria who are fed corn. I had a similar reaction with beets, and beet products. So, in my experience, if you are trying to heal it is best to stay completely away from the problem substances. I like to use nutritional yeast to season quinoa. I usually use lots of cumin and coriander with subtler additions of thyme and parsley, some sesame oil, a little salt and pepper, and two tablespoons of nutritional yeast per serving. Quinoa is already high in protein, and the addition of the yeast (more protein and B vitamins) makes it an excellent food for vegetarians. It doesn’t hurt that it’s delicious! I would stay away from his stuff. Perhaps read these articles for a ton of info…. Please correct me if I’m wrong, but doesn’t slow cooking meats basically cause the same effect of creating MSG? Mind you, my family eats slow cooked meats often; so any clarification on the matter would be appreciated. Thank you. LShae — I know nothing about this. It would be sad if it were true… I’d be interested to read any sources you come across. I have been slowly going through your archives. I like reading about the journey you and your family have been taking. I think that nutritional yeast is a great food–Sally Fallon calls it a super food. It’s high in B vitamins. When I am tired, I feel nearly instant energy after drinking a mixture of the n.yeast in water. I took to heart what she said about the way yeasts are processed, so I switched over to Frontier brand n.yeast. Radiantlifecatalog.com has it. Although I found it elsewhere for cheeper. I can’t remember off hand the site, but if you google it I’m sure you can find a place. I’ve been looking into this topic, with similar questions. Dried yeast, niacin, pyridoxine hydrochloride (B6), riboflavin (B2), thiamin hydrochloride (B1), folic acid, Vitamin B12. It appears to me that the vitamins are added to the yeast…which makes me ask where these B vitamins are sourced from? WAP foundation article quoted above specifically says that it’s not a good source of B12, so it appears that they’re subbing in these B’s but not saying so or saying why. I like to know what and why. From previous research on B vitamins, they are very complex for the body to break down. If your pee is bright yellow, you may not be metabolizing the B vitamins. The metabolic process (also known as a ‘pathway’) starts in the stomach, for example, converting the cyanocobalamin (a common form of B12) to another form, which is then converted further in the small intestines to a form called methylcobalamin, which is the type of B12 that can circulate in the body and be taken into cells. A majority of B12 is housed in the liver, and recirculates through the small intestines via the bile to offer our cells a steady supply of this essential vitamin. It’s not uncommon for a person who is ingesting plenty of B rich foods to still be deficient in B vitamins, if there are any digestive issues. This is especially common in anyone who is autistic, or on the autism spectrum. People with digestive disorders which prevent them from metabolizing B vitamins are now taking the methylated forms, with good results. “B12 requires intrinsic factor from the stomach for proper absorption in the ileum. Since the bacterial product does not have intrinsic factor bound to it, it cannot be absorbed (15). So it appears that animal sources are key in at least B12, but the nutritional yeast is a good whole food option for the other of B vitamins. Unfortunately, even the nutritional yeast companies that state their yeast is non-gmo, are growing their yeast on GMO sugar beet molasses. These have been gmo modified for the purpose of being able to use huge amounts of pesticides on the crops. You are what you eat. Why not just sprinkle some Round-up on your popcorn? Bummer! Maybe you would like to check out the Standard Process Co, They do not sell to individuals but the last time I checked there was 3 M.D.s where you can get the products. I’ve also been searching for information about the heat processing of any brewer’s yeast or nutritional yeast other than Fallon-recommended Frontier brand. So far, I have not found any description of any brewer’s yeast production methods. Fallon says “most brands” are processed at msg-producing heat levels; does that mean “all but one brand” ? Nowhere can I find whether any other brand besides Frontier is msg-free. Does anyone know of any other msg-free brand? I but can’t seem to find a way to send a question to Fallon at the Weston Price site…. I’ve used some of the on-the-shelf brewer’s yeasts for years and have stopped because of this msg info. Would like to find something available in a store and less expensive than the on-line Frontier brand. :(. Sad to say, when I’ve asked at several health food stores, the attendants have not heard of the msg question. Thank you Wardee for having this conversation, and please keep us updated if you learn any more about it ! In the US products containing yeast are not certified as GMO free. Many companies will claim that their products are GMO free. However, as the yeast in these products are grown using molasses that has been made from genetically modified sugar beets or corn, there is no guarantee that the products are safe unless they have been tested and certified as being GMO free. Does anyone know where I can buy certified GMO free nutritional yeast in the US? Wow, this is an old post – I’m a little late in the game here! Until watching your e-course on Skillet Meals, I had never heard of nutritional yeast. I’m curious, when you add it to your sauces, do you use a powder or flakes? Also, which brand do you use? I checked both Amazon and Azure Standard, but I’m not sure what is good and what is not. Thanks for your help! Is nutritional yeast safe for people with autism to consume? I know someone whose son has autism and i’m new with gluten and casein free diet. I bought Brewer’s Yeast to add to my dog cookies because it was to add nutrients and had a nutty taste. I later read I needed Nutritional Yeast for my dogs cookies. I did not realize there was so much involved in one product from another. I will do further research on this.